Students returning from spring break to Marjory Stoneman Douglas High School in Parkland, Fla., on Monday were greeted with metal barriers and clear backpacks — new safety measures enacted in the wake of last month’s mass shooting at the school. 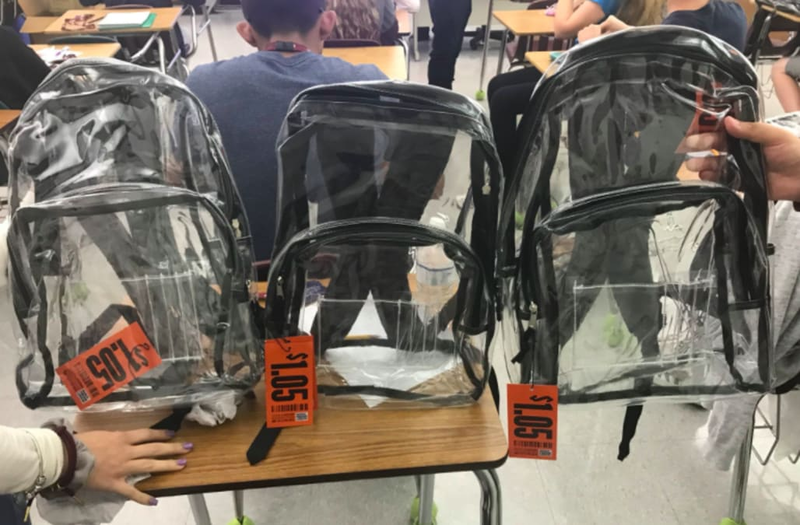 More than 3,000 translucent backpacks and lanyards for identification cards were distributed to Stoneman Douglas students on Monday morning. Students were told to report to school without backpacks. Those carrying sports equipment or band instruments were asked to leave them with teachers or coaches before the start of classes. Extra police officers have also been stationed at the school since the Feb. 14 massacre. School officials say the mandatory backpacks and entry checkpoints are temporary, part of pilot safety program that may be enacted throughout the school district. Many students mocked the backpacks in social media posts, with some attaching orange tags emblazoned with “$1.05” — an amount they say they derived by dividing the number of students enrolled in Florida’s schools by the money Republican Sen. Marco Rubio has received from the National Rifle Association. Others compared the pre-school check-in procedure to TSA lines at airports.